This HAS to be the cheapest date night you can have with yourself. Or with someone if you both aren’t that hungry. 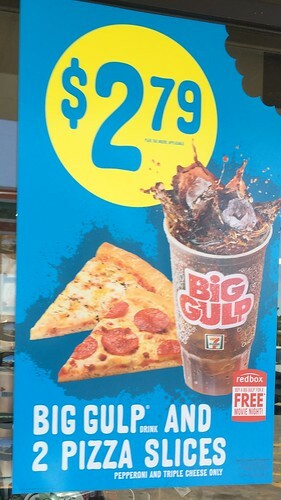 TWO dollars and Seventy-nine cents (okay…it’s actually like $3.03 with tax) at The Sev, and you get a Big Gulp, two slices of pizza, and a coupon for a FREE RedBox rental (which are normally just outside the front door of The Sev). After a particularly horrible day, this might be the perfect end to that “perfect” day. Pizza and a flick for $3.03 is just silly-cheap. Available now at every single Sev I pass, so jump on it now.